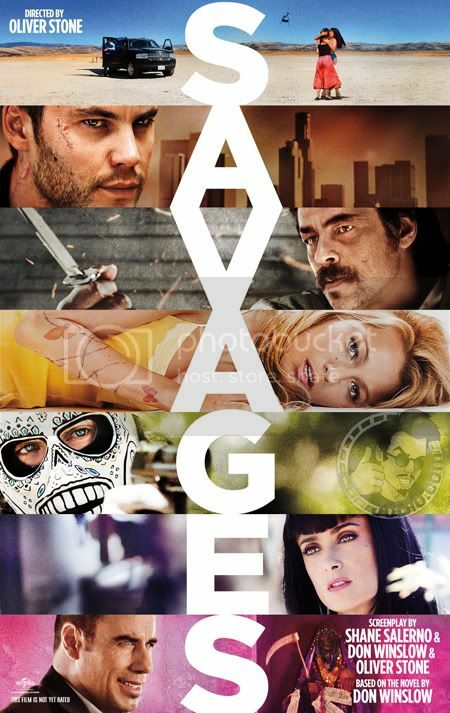 "Hang on baby, we're coming for you"
Universal has unveiled Oliver Stone's new thriller, Savages. And even though their latest poster (see below) is a rip off of the 2006 poster for Babel, the trailer is anything but. This has a fun all star cast including the gorgeous Taylor Kitsch, Aaron Johnson, Benicio del Tor, Blake Lively, Uma Thurman, John Travolta, Salma Hayek, Emile Hirsch and many more. It definitely looks exciting, thrilling, not to mention high in intensity. I'd be down for seeing this in theaters. Take a look! Savages based on Don Winslow's book of the same name, with the screenplay co-written by the author and screenwriter Shane Salerno. The story follows two young, independent Laguna Beach marijuana kingpins (Taylor Kitsch and Aaron Johnson) who are blackmailed into working for the Baja Cartel after their girlfriend Ophelia (Blake Lively) is kidnapped and held for a ransom of every last dollar they've made for the past five years. The film is currently slated for a July 6th, 2012 release date. Hmm.... Maybe it's worth a watch on Blu-ray, but I'm not going to rush out to the theaters to see it. Changed my mind. This movie might actually be worth going to see. The cast is an interesting mix and I liked the movie Babel.